NYC is a city of contrasts. This week, for example my very brave friend Jess made something of a public declaration of hope on her blog. Not entirely out of the blue, you understand, but because she has met a very nice man. “The new journey is still a mystery as all good journeys are, but instead of over-thinking it I’ll sit back and enjoy each moment,” she said. In a city like New York, this kind of thinking in the face of dating adversity and trial, counts as especially heroic. It was enough to make you feel all warm inside, a believer in love, a hoper, a dreamer. Then another friend called to say that he’d been on a blind date. Like I said. City of contrasts. And so, I suppose, to the balcony. Producer of basil and tomatoes and mint and cilantro slap dab in the middle of urban chaos. 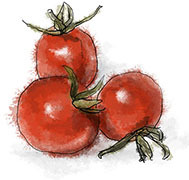 And so to dinner – a famers’ market summer special – roasted tomato pasta, which soothes, inspires, and makes believers of us all I suppose. This entry was posted in This Dinner Will Get You Laid and tagged balcony crop, contrasts, dinner, djating, friends, Grace, hope, love, olive oil, pasta, summer, tomato. Bookmark the permalink. I made this tonight and it was quite delicious. Very light and tasty. I got to use the basil that I have been growing and some honey that I bought at the farmers market. I’m so glad that you enjoyed it. 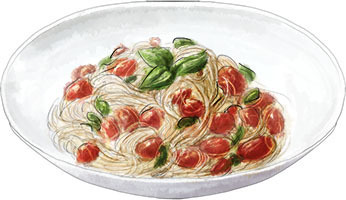 I really love that combination of flavors – and it’s such a good feeling to use basil from the pots outside, isn’t it?